Long renowned for its historic sites and desert adventures, Jordan is building a reputation among wildlife enthusiasts – especially those who enjoy life’s smaller pleasures, reports Huw J. Williams. The sudden movement grabbed my attention; then, in a black flash, it was gone. I was panting my way along the dry riverbed of Wadi Dana, and it was already so hot that – apart from the insects, my guide Mohammed and me nothing appeared to be awake. But alerted by that burst of activity, I scampered off the trail to get a better look; there, momentarily frozen on a boulder, was the lithely coiled body of a 1.5m long Syrian black snake. I was glad that I hadn’t got too close: they aren’t poisonous, Mohammed told me, but will bite if cornered. They are also, as I discovered, excellent climbers: this one shot straight up and over a 3m boulder. It was that day’s first sighting of anything larger than a bird, but I was content to let it slither off without further study. Dana Biosphere Reserve covers 320km2 of saw-tooth ridges, sheer cliffs and deep wadis (riverbeds), the northernmost tendrils of the Great Rift Valley. Arriving by road, my route was flanked by gently rolling hills, but when I stood on the balcony of the Dana Guesthouse at the park’s edge, the sublime view was starkly different. 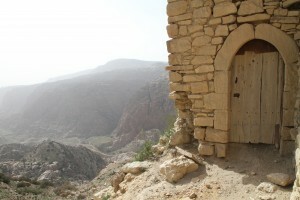 It was as if a huge bite had been taken out of the Earth’s crust; the rocky land dropped away into Wadi Dana down a precipitous slope directly below my feet. As stunningly beautiful as Dana’s vistas are, it would be foolish to ignore Jordan’s other wild areas. Its tremendous variety of natural landscapes harbour highly diverse ecosystems – and a rich mix of species to match. Take Wadi rum. Known to adventurers as one of the world’s most spectacular desert environments, it’s now home to a herd of reintroduced arabian oryx. Extinct in Jordan for many decades, this proud antelope now has footholds in the country at rum and the northern Shaumari Wildlife reserve. Then there are the stark mountains and river canyons of Mujib, which are patrolled by herds of Nubian ibex. Add to that a new reserve opened this year in Yarmouk, an imposing landscape of steep-sloped valleys cut by spring-fed streams, and two more parks scheduled to open in the next 12 months or so: Fifa, a rare dense acacia forest, and Qatar, a sand-dune desert believed to be home to the globally endangered sand cat. Even Petra, famous for its Nabataean temples carved from the red sandstone cliffs, is a wildlife haven, the protection afforded its monuments ensuring that it provides a sanctuary for many birds and mammals, too even so, Dana is one of my favourite places in Jordan and I visit it whenever I am in the country. It’s just so convenient for the wildlife lover: the reserve tops out at 1,500m, but plunges through cliffs of limestone, sandstone and granite to 100m below sea level. The dramatic change in altitude over such a short distance makes Dana a habitat multi-pack. As a result, in just one day you can experience four different ecosystems simply by descending into the wadi. The reserve hosts more than 800 plant species, a trio of which are found only in the reserve, 36 reptile species and 37 mammals including caracals and wolves. Then there are the birds – some 190 species. In just a few minutes spent on the Dana Guesthouse balcony I had spotted nine birds, including a glossy Palestine sunbird and a lesser kestrel. 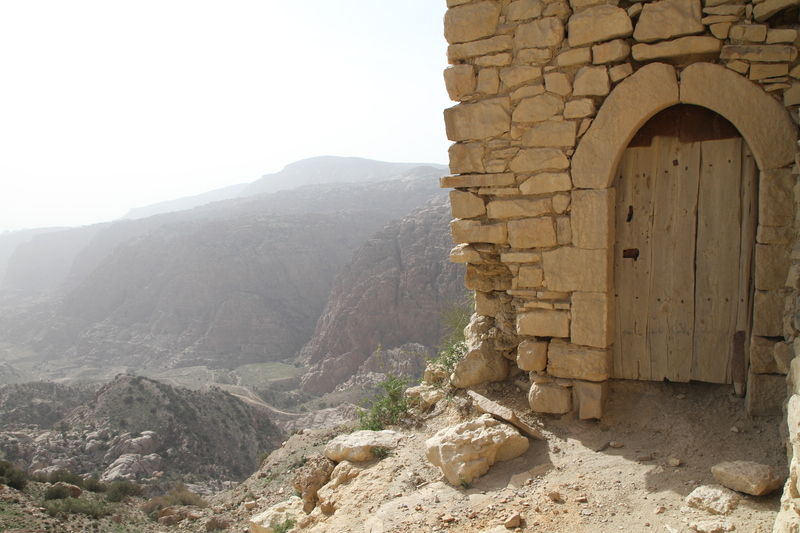 Heading out on the trail of ibex, Mohammed led me on a 14km walk, first through Dana village – an ancient settlement of low stone buildings that resemble houses from a biblical story – and down Wadi Dana to Feynan ecolodge, set on the desert floor far, far below. Up high, the rocks were sculpted into intricate, rounded shapes; among them sprouted abundant oleander shrubs, with vibrant pink flowers and a sweet scent, eking out a precarious existence on what precious, scarce moisture they could find. Mediterranean cypruses grow here, too, at the southernmost extent of their range. Barn swallows, common and alpine swifts and rock martins swooped above me, flying so fast and so close to my head that they sounded like a fencing foil slicing through the air. A small track of footprints intersected our path. “A golden jackal,” said Mohammed. “It walks this way every morning. Wake yourself very early and you might see it trot past the guesthouse.” As we descended still further into the wadi, suddenly there was sea squill everywhere, looking like a huge field of fat onions. Mohammed stopped to point out scrapes in the earth. “Crested porcupines love these,” he said. “They dig down and eat the bulbs.” above us, I noticed white stains streaking the sheer red sandstone cliffs, small smears running down from ledges. Before I could even pose the question, Mohammed pointed to three soaring griffon vultures. The ledges were where they nest, he said, and the stains were their droppings. As we reached the bottom of the wadi, I recognised for the first time how the habitat had changed incrementally – almost imperceptibly – as we descended. In the arid heat of the canyon, fewer plants thrived; the odd acacia tree was the tallest vegetation in sight. Many of the plants that did survive here had shiny, spongy leaves and stems designed to reduce water loss, a typical adaptation for desert living. There were fewer birds, too, and the silence was dense – even overpowering. It was here that I spotted my Syrian blacksnake, its appearance proving that life at this altitude is no less fascinating for being less plentiful. It was here, too, that I realised how Mohammed had helped me to appreciate the richness of this reserve, pointing out the small elements that make up the whole – details that I could easily have overlooked if I had been straining my eyes for a glimpse of an elusive ibex or caracal. The diversity of habitats in Dana fascinated me, but for an even greater contrast I traveled north to ajloun Forest reserve. This evergreen oak, pistachio and strawberry-tree forest covers 13km2 of rolling hills. As with Dana, it’s best explored on foot, taking one of several guided and self-guided walks following narrow, twisting routes through the trees, traversing the undulating slopes and breaking the canopy cover to cross boulder fields of huge bone-white, limestone outcrops. Ajloun in spring was an explosion of colour. The land was so thickly carpeted in wildflowers that the green of the grass was barely visible; poppies, black iris – Jordan’s national flower, star of Bethlehem, chamomile and cranesbills were among the species competing for attention in the rich, cocoa-coloured soils. As in Dana, the forest’s mammal residents – roe deer, beech martens, Persian squirrels, grey wolves and striped hyenas – eluded me. The only signs I spotted were long, deep gouges in the soil where wild boar had used their snouts to dig for roots. The closest encounter I experienced came later that night when I was roused by the barking of excited fox cubs at play. Yet, as I was strolling through this sylvan paradise, dappled sunlight slanting through the leaves, the lack of mammal sightings didn’t manage to dampen my spirits. Taking my cue from Mohammed, I focused on the details: the silky texture of the strawberry-tree bark; the crumbly richness of soil pushed up into molehills; the birds that were heard but not seen. My explorations of both reserves had fostered an appreciation of Jordan’s wild attractions. I had learned the value of looking down, at plants, insects and even signs in the dirt; to appreciate the habitat and not only seek the celebrity species. And so it was that, armed with this new empathy, I was rewarded with a singular sighting as I emerged onto a barren hilltop. Above me, a pair of short-toed eagles soared, then one peeled away in a steep swoop, disappearing behind a ridgeline. Seconds later it appeared again, climbing slowly, a snake in its talons. Not my snake, but a reminder of the interlinked nature of Jordan’s diverse habitats.